Nomzamo Mbatha at the Dove Ri.Ch Factory show. A collaboration between Dove and Ri.Ch Factory really was a celebration of 100 colours. In day one of AFI Fashion Week Joburg, designers such as Matte Nolim and Ri.Ch Factory presented their collections to attendees at Melrose Arch. Others from the rest of the continent such as Deola Sagoe and Clan from Nigeria, Kahindo from the DRC, and Haute Baso from Rwanda will be showing over the next few days. 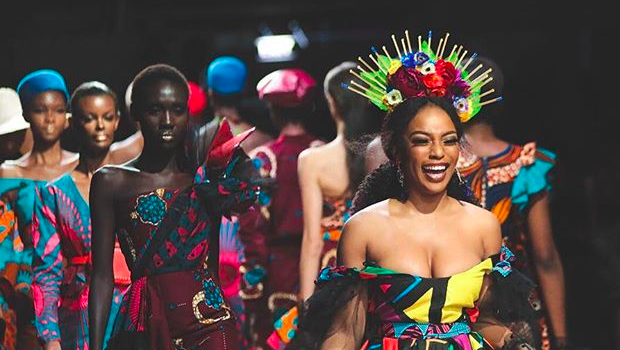 A bubbly Nomzamo Mbatha as queen crowned with flowers, walking down the runway in a covetable custom-print gown as part of the Dove and Ri.Ch Factory collaboration. 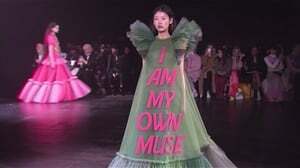 And the gown revealed. Those colours and that print are spectacular and a beautiful reminder of the wealth our country holds. Here's a snap of Nomzamo with the designer Rina Chungakutuma. And a quick video of the gown in action. It's made us happy as a true herald of summer. How about you?